Another 7 days down the drain, which means it is time to open up all my packs from the weeks before and scrap down all my extras for silver. For reference, here is the collection status as of Day 7. So let’s jump in and open some packs. Again, I have video format for those of you who care and then will write out the important cards below for people who don’t want to listen to me ramble for 7 minutes! Note that I get to open 35 packs today. An incredible sum helped immensely by the 20 packs for 100 wins (online / total). Legendary – Scythe of Chiron; Nexus Aeronaut; Frostmane Dragon; Nexus Bubble; Xithian Shambler; Nethershriek; Flowsteel Prototype. Heroic – Venomous Netherscale x2, Leyline Demon, Umbruk Lasher. Rare – Lysian Shard, Xithian Direhound, Mosstodon, Oratek Battlebrand. 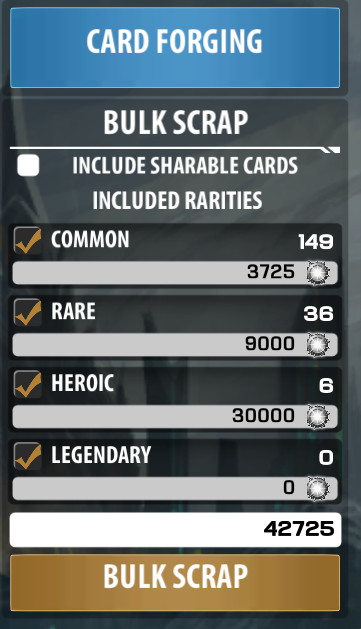 Lots of legendaries today, and I have lots of Alloyin legendaries in my collection in general. It’s just too bad that most Alloyin Standard decks are incredibly legendary heavy, so despite opening a lot of them, it is hard to make an Alloyin deck in Constructed. That leaves me with a great lot of silver in scrappings – 42,725. That’s why I’ve been taking every heroic – they really add up! At this rate, I think we can be constructed ready in another week or two. Even if I do horribly at all my drafts!